Renée is wearing the costume. She got the idea when she figured she wanted to win and Emmy someday. So she did a bunch of research on the Emmy award to make sure she would get all the details right and understand the full reason of its figure. It is probably the only girl trophy recognizing creative arts and sciences in television. Fortunes were spent on supplies. She got her mom’s help so sew her design of the maxi, halter top romper. She engineered her way through creating stable water proof wings. Her dad helped her with putting together the atom, she carries, out of tomato cages in a year advance. Shopped through stores finding the correct gold shoes and bodysuit. She couldn’t have done it without so help/revisions of her parents to carry her design. 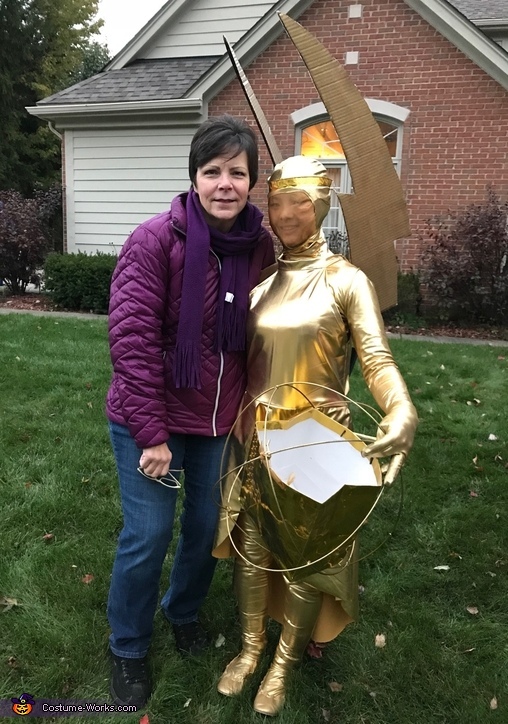 Trick or treating was easy when she used a gold bag in the atom for the candy and made the award ceremony/cataglory card envelope, to carry belongings, on her wrist. Wow that looks amazing! I really hope you win! !